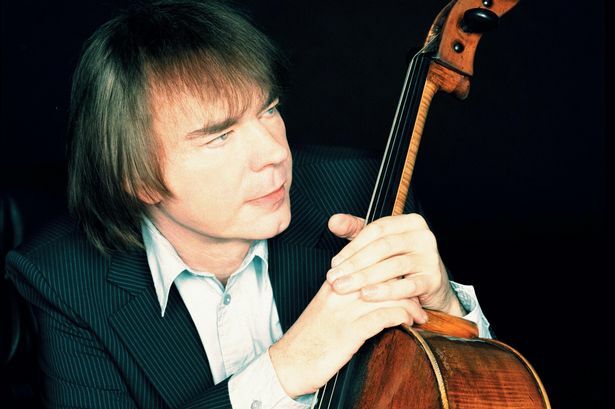 World class cellist Julian Lloyd Webber gave his final live concert at Malvern’s Forum Theatre on May 2, 2014. Exactly nine months on, the mental anguish of no longer being able to perform is still greater than the physical pain he had to endure while playing despite a neck injury which had weakened his right (bowing) arm. Having spent years practising for more than four hours per day to grace the world stage, Julian’s involuntary exit from the international spotlight has also produced an extraordinary kind of headache – what to do with his c.1690-1700 Stradivarius cello. Yes, it’s quietly up for sale, folks, with vital statistics including length: 29 15/16”; breadth upper part 13 ½”; breadth lower part 17 3/8”. But a 325-year-old instrument acquired via Sotheby’s in 1983 for a then world record (but undisclosed) price is not the sort of thing you can just stick on eBay and hope for the best. Nor would he necessarily be prepared to offer it to someone like an oil rich sheikh as the plaything for a child. “It’s not really about the money,” says Julian, now 63. “I don’t even have it with me at the moment, but the main thing about an instrument like that is that it needs to be played. One of the ownership contenders is not going to be fourth wife, Cheng Jiaxin (2009), despite being a leading cellist in her own right. How much is the Stradivarius worth, I ask rudely. “It depends how much somebody really wants it,” he replies. “There are some very good cellos being made today. “The most extraordinary thing about Stradivarius is that he had no idea of the kind of places that his instruments would end up being played in, such as The Royal Albert Hall. “And yet the are still the instruments with the biggest sound. “Despite all the technology, modern manufacturers have still not been able to create an instrument that sounds like that. “They get close, but I think a Stradivarius is still 10 per cent better. How has he looked after it? “I’ve done the minimum necessary,” he says. “I didn’t want to mess around with it. “I polish it every now and then but haven’t changed things and I have tried to look after it. “For example, I’ve tried to keep it comfortable, like a person, by not letting it get too hot or too cold. Antonio Stradivari was born in 1644, and ran a workshop in Cremona, Italy, until his death in 1737. Today, it is thought 650 instruments survive from more than 1,100 harps, guitars, violas, and cellos that were made. The best can go for millions (and that’s either pounds or dollars). Julian’s instrument is known as the Barjansky Stradivarius cello, after its former Russian owner Serge Alexandre Barjansky (1883-1946) used it to premiere the Delius Concerto in Frankfurt on January 30, 1923. A member of the Leipzig Gewandhaus Orchestra, Barjansky played the 1912-13 season Dvořak Concerto at The Queen’s Hall London with the London Symphony Orchestra conducted by Elgar. Today, Julian is president of the Elgar Society and his desire to the right thing for the instrument is reflected in his new approach to music. Playing a concert, he reckons, takes an extra 20 per cent over and above the level you train at. Jacqueline Du Pré, whom he grew up watching playing live in London, was forced to retire at the age of 28 by multiple sclerosis in 1973, just a year after Julian’s debut at the Queen Elizabeth Hall in London. Julian Lloyd Webber and his wife. “I gradually got to know her, but only when she was very ill,” he recalls. “By then, her performance of Elgar’s Cello Concerto had become the benchmark. “The way I played was significantly different so I thought: ‘I can have a shot at this’. Three of his other favourite composers are Russian: Shostokovich, Prokofiev and Rachmaninoff. “It’s the mark of a great piece that there are many ways it can be played,” Julian explains. “And the more ways it can be played the better it is. While he hasn’t done too badly for career longevity in comparison with Jacqueline du Pré, Julian still has the nagging thought that he has been cheated of some of his best years. Some cellists keep playing into their eighties. The question now, then, is where does he go from here? The answer, in the short term at least, is on a UK tour that will last until July 4 and take in some unusual destinations. Among them on April 11 will be Colne, a Lancashire mill town with a population of less than 20,000 at the last census. Midland dates include the Roses Theatre, Tewkesbury (March 1), The Bromsgrove Artrix (May 12) and Solihull Arts Centre (May 21). Traditional classical concerts feature an orchestra sitting down, the conductor walking out and then waving his baton to start them off. During Julian’s tour, he will even invite members of the audience on to the stage for a once in a life-time mini masterclass. I proffer that he’s an agreeably open sort of chap. “I don’t think musicians can hide away from society,” says Julian. “I don’t think we live in that world. “That’s what this tour is all about, breaking down those barriers. “I am passionate about education and had it not been for my injury, I would never have done a tour like this. Julian believes that silence would have been the case in Elgar’s day when, surely, audiences flocking to the concerts would have felt like they were watching a magic trick – able to see and hear what was happening without quite being able to comprehend the breathtaking mixture of skill and fluidity. “I still practice for an hour a day just to keep it going because I don’t want to lose that skill,” he says. “But I’m not playing on this tour, unless someone brings a cello on at the end. “There will be a variety of video clips and a Q&A at the end, so it will all be very informal. “Times change and people seem to want more from musicians, including appearing at receptions with sponsors. “You just can’t come and go any more, but that’s not such a bad thing. “So I am hoping people will bring their children for what will be a celebration of music and fun. For the young Lloyd Webbers, fun was playing five instruments between them as you might expect from the children of a composer father (William Lloyd Webber) and violinist / piano teacher mother (Jean Hermione Johnstone). After marrying journalist Celia Ballantyne in 1974, Julian’s second marriage in 1989 was to Zohra Mahmoud Ghazi, a great niece of the Afghan King Zahir Shah. Following a third marriage, to French-Algerian Kheira Bourahla, he married again in 2009 to fellow cellist Jiaxin Cheng, who recently (whisper it quietly) turned 40. Their daughter, Jasmine Orienta, was born in June 2011, and takes her second name after Julian’s lifelong support for Leyton Orient (who are currently “really bad”). Looking back at having to face up to the end of his playing days, Julian adds: “It was a horrible time. “I could have had surgery, but with no guarantees, so it wasn’t worth it, not with a young daughter. “So you live with things. Given the health and safety age we live in, I wonder if Julian’s injury might have been avoidable if he’d been shown the correct posture. “None of the experts I saw was able to say it was a playing injury,” he explains. “It’s the wear and tear of life. Unlike his brother Andrew Lloyd Webber, Julian has always forged ahead with his own career by interpreting other people’s music rather than by composing his own. “I have never been a composer,” he says. “I have written a few short pieces, but would rather get involved with music education, that is more where my talent lies. “In that respect I think Andrew and I use different areas of our brains. I apologise in advance for asking my next stupid question, but couldn’t he have trained himself to play with his bow in his left hand? “I did think of that,” he says, kindly. An Evening With Julian Lloyd Webber will include him recounting stories and anecdotes of touring, recording sessions, concerts and TV shows, there will be rare video footage of him playing and talking with stars including Nigel Kennedy, Elton John, Katherine Jenkins, Tim Rice, Yehudi Menhuin, Joaquin Rodrigo, Cleo Laine, Stephane Grappelli and many others. Was he ever intimidated playing with such legends? “Sometimes, I was,” Julian admits. To compliment the chat and clips, he will be joined by his wife and fellow cellist Jiaxin Lloyd Webber and pianist Pam Chowhan to perform works such as Faure’s Elegy, Andrew Lloyd Webber’s The Music of the Night, Rachmaninov’s Cello Sonata as well as works by composers William Lloyd Webber, Philip Glass, Frank Bridge, and JS Bach. Tickets for Julian’s tour are £25 person.